5 Reasons to Upgrade Your Restaurant With a POS System! What all strikes in your mind when you plan to upgrade your restaurant in order to get better sales? Better infrastructure, more skilled staff, better technology tools. That’s it, right? But in the ever running world which outdates the existing technology every moment, it becomes a necessity to channelize our investment properly to get better outputs. And when we talk about the food industry, there is stiff competition in the market. The moment you search for a restaurant in your locality, you get thousands of restaurants nearby you offering exciting services and discounts. Agree? Now the point is, where does your restaurant stand out of all this huge competition? Is your restaurant offering something extra-ordinary from others and does it has a unique brand name in the food market? In this fast technology world, various restaurateurs have got the feature of POS "Point of Sale” system and are experiencing its benefits broadly. Till date, POS systems were used for payroll generation and online payments for customers. But with time and advancement, POS has widened its reach by offering easy assistance in managing all the major tasks carried out in a restaurant. 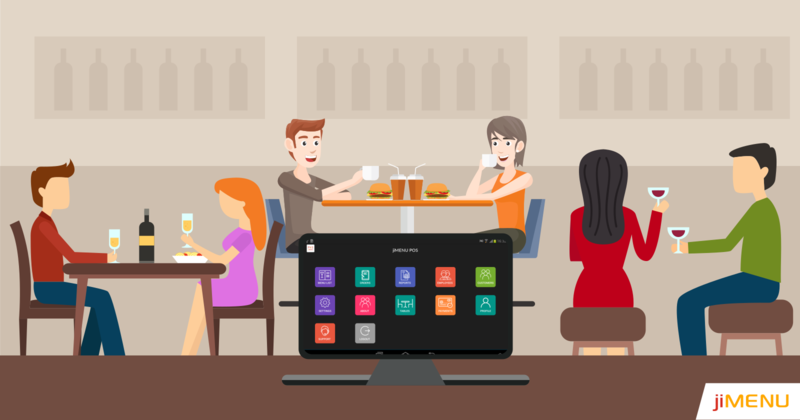 Here’s how a digital menu POS system is going to benefit your restaurant and in which all ways! Table Management: Once the customers reach your restaurant, the next thing they do is look up for a table. Right? What if they can book the desired table themselves and enjoy their meals? Exactly this is what a POS system will do for your customers. Guests can check the availability of the tables via digital menu screen provided to them, choose the desired one, and book it instantly. This would let the customers choose vacant seats as per their wish and offer your staff an ease with the table management issues. Moreover, customers can even make an advanced reservation in case of any party or a family function. Making easy orders: Instead of engaging the staff in taking orders manually and facing hard times during peak hours, the POS system will eliminate all the hassle by allowing the customers to make their orders themselves accurately. The customers are provided with a digital menu screen over which they can make the desired orders which further gets transferred to the kitchen areas. This will reduce the burden on the staff too and due to less engagement in taking orders, more focus can be made on improving the food quality. Restaurant progress analysis: Monitoring the sales and profit you made last month has never been easy for all of us. Isn’t it? Rather it is a time-consuming task too. POS system allows the restaurant managers to analyze complete sales made by the restaurant as per the food categories in a clear graphical form. Based on the outputs, you can get a clear idea about which all food categories do you need to improve the quality. The managers can go through the reports either on a monthly or a weekly basis as per the schedule of the restaurant. Multiple payment methods: Customers can pay their bills easily via POS system, instead of standing in the long queues at the reception and waiting for the staff to get back the balance amount. Moreover, customers get multiple payment options for paying the bills either via cash, cheque, or their credit cards. Where to get a POS? Once you are clear with the above benefits, you would definitely look up for a solution which offers you POS system. Right? jiMenu POS is one such ideal solution which includes all these features in a very cost-effective manner. Offering you 24/7 support services in a user-friendly manner. Get a free demo from us or simply reach us at our website for further details.